Prep, cook and serve foods with fresh, flavorful oils using the Rachael Ray(r) Stoneware EVOO Dispensing Bottle, the ideal kitchen accessory for drizzling and dispensing at the counter, stove or table. Rachael Ray(r) designed this clever stoneware dispensing bottle to make oils easier and faster to pour around the pan for a couple of "turns." The bottle's spout is proportioned to help provide perfect pouring control and a clever freeform handle integrated into the curved bottle design provides ample handhold. Crafted from sturdy, solid stoneware and glazed with warm, earthy color, the 24-ounce bottle is ideal for adding extra virgin olive oil to warm bruschetta, poached fish, savory pasta dishes and other culinary favorites. Sporting that super, Rachael Ray(r) design and functionality, the stoneware bottle offers relaxed style in the kitchen and at the table. Dishwasher safe for convenience, the eye-catching olive oil bottle complements stylish dinnerware with a pop of personality. And it makes the perfect partner for stoneware dipping cups, salad plates and serve ware pieces in Rach's collection. 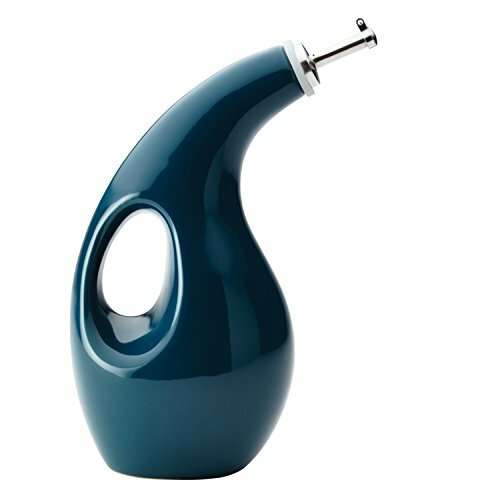 Drizzle your favorite, freshest olive oils on warm, crusty breads and other delicious foods using the Rachael Ray(r) Stoneware EVOO Dispensing Bottle.